AbstractAn important adaptation to land habitats in terrestrial isopod crustaceans is development of embryos in a fluid-filled female brood pouch, marsupium. The study brings insight into the structure and protective role of egg envelopes and cuticle renewal during ontogenetic development of Porcellio embryos and marsupial mancas. Egg envelopes cover embryos, the outer chorion until late-stage embryo and the inner vitelline membrane throughout the whole embryonic development. Egg envelopes of Porcellio have relatively simple ultrastuctural architecture compared to Drosophila egg envelopes. Exoskeletal cuticle is produced in late embryonic development by hypodermal cells of the embryo and is renewed in further development in relation to growth of developing embryos and mancas. Cuticle structure and renewal in prehatching late-stage embryos and marsupial mancas exhibit main features of cuticle in adults. Epicuticle is thin and homogenous. 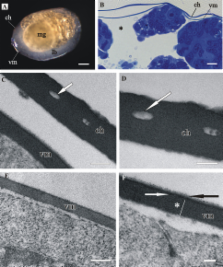 The characteristic arrangement of chitin-protein fibers and the dense distal layer in exocuticle are hardly discernible in prehatching embryo and distinct in marsupial mancas. Endocuticle consists of alternating electron dense and electron lucent sublayers and is perforated by pore canals in both stages. Differences from adult cuticle are evident in cuticle thickness, ultrastructure and mineralization. Signs of cuticle renewal in prehatching embryo and marsupial mancas such as detachment of cuticle from hypodermis, partial disintegration of endocuticle and assembly of new cuticle are described. Marsupial egg and embryo coats. Stage sensitivity of medaka (Oryzias latipes) eggs and embryos to permethrin.